My husband’s grandmother used to tell of a story—and my middle aged brain does not remember the details—of a visiting missionary. As the ladies gathered dockside at her approaching boat, the missionary crestfallenly noted they were wearing pearls while the church ladies observed with disappointment the missionary was wearing white shoes. Or the missionary had the pearls—I can’t remember and it doesn’t matter because it illustrates the point that we all carry expectations of what fellow ministry wives must wear, not wear, be, not be, do or not do. These expectations can be held and communicated by the majority as a vague, inherited tradition of maintaining the “status quo,” or they can be explicitly stated by a guileless outspoken individual. They are communicated through “jokes” and jabs (I thought you were a pastor’s wife), used as a stick to control or rebuke (but you’re a pastor’s wife), or shared among a gossipy grumbly few (and she’s supposed to be a pastor’s wife). There is no question that this is a common challenge among ministry wives. The challenge is compounded because there really is no hard and fast job description in Scripture that we can rest on, yet it is clear that each church culture communicates certain expectations to ministry wives. Some wives are expected to exercise a certain skill set or spiritual gifts. They are expected to conform to a particular culture of leadership or non-leadership. They must be a counterpart of all marriage counseling sessions, or be utterly ignorant of anything Husband-pastor is doing. Sometimes they are expected to be invisible, smiling and silent. When we become preoccupied with others’ expectations of us, it can create emotional and relational distance, especially when neither the ministry wife NOR the rest of the congregation is sure of how to relate to one another. Continual comments, guileless or otherwise, can lead to real discouragement, confusion and loneliness, even resentment at being treated differently. The pressure of expectations can lead to burn out and disillusionment that we’ll never measure up. We could all rehearse appalling and shocking things people have repeated to us about ourselves, our kids, our marriages, our life choices—suffice it to say that we absolutely must deal with this very real component of ministry life head on. Living with expectations placed upon us is unavoidable. We have the choice to respond in the flesh or by faith. Perhaps you are utterly undaunted by this. Maybe you have thick skin and constant comments really do not bother you. I know people like this. I am amazed by them. But for the rest of us, living in a fishbowl can be terrifying. And no matter how iron-clad your church may be in terms of division and slander, jokes and opinions of you and your children do occasionally waft back around. And we must deal with them. One silly example: Has anyone ever bought your husband a tie, because, as he explained (laughing of course) he was tired of looking at the same one? Funny. A good laugh. I shouldn’t take it to heart. But afterwards I’m mentally combing though our meager closets—and not just his, but mine and my children’s, wondering what they all think of our attire. Because they DO think something. Are they discussing our clothes? Are they laughing at my kids’ hand-me-downs and my own ten-year old outfits? Will I eventually hear those comments and how will I handle them? Such is life in the fishbowl. 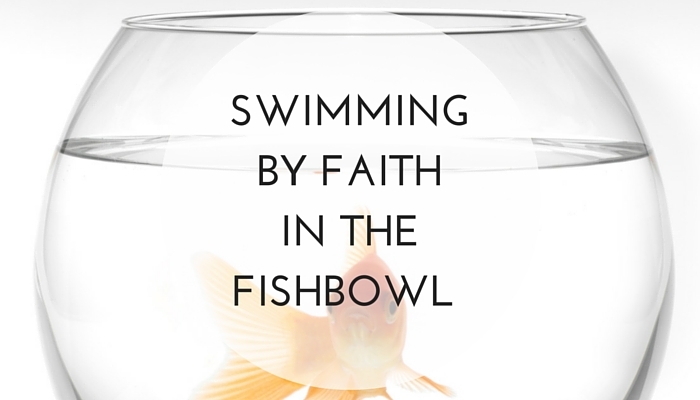 However, the fishbowl does bring a measure of accountability and sanctification. It exposes areas of weakness and those dry dusty places where we need the Spirit’s Living Water to seep down deep for refreshment and growth. I never would have chosen this path for my growth, but you know who did? MY precious Father who only ever does me good, who knows me best, and shepherd-like, leads me in paths that will conform me to Jesus and bring HIM the most glory. Living with unavoidable expectations placed upon us as ministry wives provides us with: 1) the powerful opportunity to mortify fear of man, 2) the gracious opportunity to lean hard on Christ and his word, and 3) the glorious opportunity to learn to answer to God alone. Fear of man is giving in to the lie that others’ thoughts, words, actions, favor and disapproval are more valuable, trustworthy, defining and powerful than God’s. [quote]Fear of man is giving in to the lie that others’ thoughts, words, actions, favor and disapproval are more valuable, trustworthy, defining and powerful than God’s. [/quote] We put this mindset to death because it is sin and a snare. Micah says “He has told you, O man, what is good.” The wise woman builds her house, but the foolish woman tears it down with her own hands. Let’s build our house on the solid foundation of Christ and his word, not on the shifting sand of the wisdom of the world. Many voices about how we should live ought to drive us to scripture. What does Christ require? What is the good he has told us? How do I nurture my newborn? Do often do I practice hospitality? How many children should we have/adopt/foster? How much money to give away? How to make money? What neighborhood to live in? How to talk about politics? How Pintrest-y should my life be? We do not live by polls or surveys or Facebook feeds, but by every word that proceeds from the mouth of God. [quote]We do not live by polls or surveys or Facebook feeds, but by every word that proceeds from the mouth of God. [/quote] It is our bread, our drink, our home. We abide in Christ and in his word. We orient ourselves to it. We study it and become proficient in it. And its voice ought to be the loudest one we hear. When others proclaim their opinions and standards, expressing approval or disapproval of how I grieve, how I suffer, what I do and don’t do, when others express opposition to how my husband is handling or not handling something—I am reminded to have no other gods before me and live before God alone. Come to me, all who labor and are heavy laden, and I will give you rest. Take my yoke upon you, and learn from me, for I am gentle and lowly in heard, and you will find rest for your souls. For my yoke is easy , and my burden is light" (Matthew 11:29). Living in a fishbowl isn’t easy, but we are not living there alone. [quote]Living in a fishbowl isn’t easy, but we are not living there alone. [/quote] Let’s fill our vision with himself and we will one day bless God for the very places he sets us, for they teach us of our need of him, praise his name!